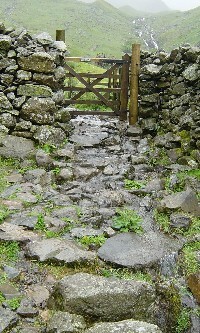 "The way out of Rosthwaite starts along the valley of Stonethwaite: the only breach in the lofty eastern wall of Borrowdale. It is a walk in heaven"
Once again Kev's head is spinning this morning, this time it is not alcohol induced but a lack of care when going through doorways in the guest house, which was an old cottage with very low ceilings. So many choices, today is a day of decisions as there are a number of alternative ways we can take. 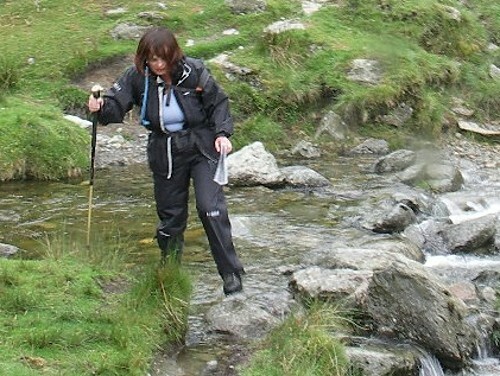 When we originally planned our route from the comfort of home we decided to cross the main lakeland hills in one day. At 16 miles (20km) the distance is no longer than most of the other days but sitting at home you tend to forget how much effort is required to get up and down several major hills or what effect the weather will have. We can if need be follow low level tracks along valleys, but it would be nicer to get to this evening's destination by taking some of the high level routes instead, after all how would we know if we could do it if we hadn't tried? 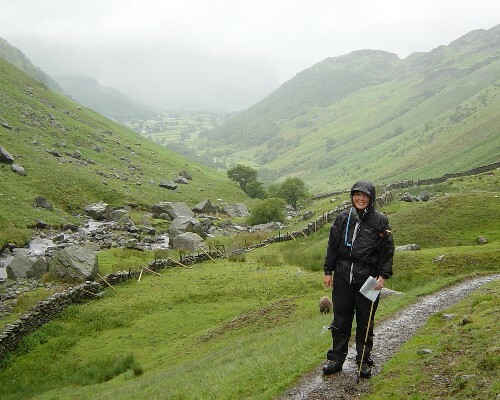 Our initial plan is to head towards Grasmere along the valley before then taking one of two high level routes to reach Patterdale. From Grasmere several possibilities present themselves, we could take the easy low level path all of the way and then ascend Helvellyn, the third highest mountain in England before descending down one of two narrow rock edges that make up the Helvellyn horse shoe Striding Edge, the way I went 25 years ago, or the less severe Swirral Edge. Both these edges are narrow ridges with precipitous drops either side and just about enough space to walk along the pointy bit at the top. 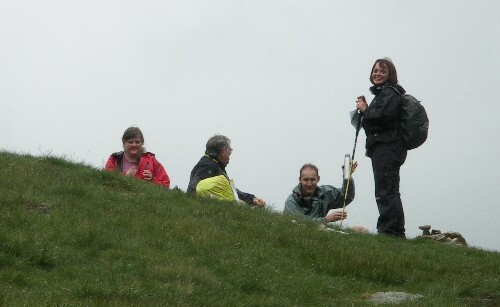 On a previous visit to the area we walked up Helvellyn along Striding Edge in heavy mist. Later while looking at pictures of Striding Edge on some postcards, Lizzie told me that she would not have made it if she had been able to see what she was walking along at the time, she only got stuck once (climbing over a crevice) and we did have the added excitement of sitting at the top watching, through breaks in the cloud, as an ill prepared Japanese couple were airlifted from the edge. The last option for today's route was to ascend St Sunday Crag before then dropping down into Patterdale. 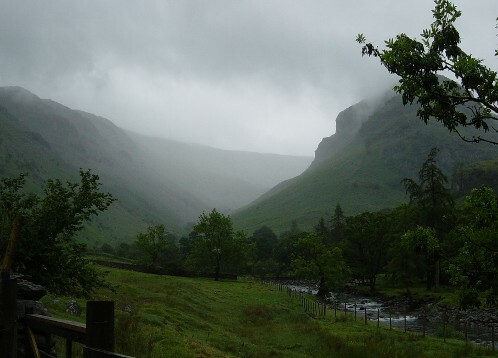 It is this option that we have our minds on as we leave Stonethwaite with a fine mizzle falling, not quite mist but not fully fledged drizzle. Sadly clouds obscured most of the valley but from what we could see this route was not as flat or as dull as some of the guidebooks imply, waterfalls tumble in to the river below and on a good day Wainwright might well be right - it is a walk in heaven. It was starting to rain and the path was not so easy, lots of little streams to cross with stepping stones made it slow going and when we weren't crossing streams the streams were running through gates and down the path! As the path headed up towards Greenup Edge we met up with some fellow coast to coasters, Duncan with his wife, Naomi, who we had first met sheltering from the storm at Black Sail hut the previous day and Jeff who had stayed at the same guest house as us last night. We all sort of arrived at the same point together along with another young guy called Dominic who was being very brave and camping out under a piece of tarpaulin draped across his trekking poles, although the rain would eventually force him into more sensible accommodation some nights. We all headed up Green Gill and onto Far Easedale where those opting for one of the higher routes turned off leaving Jeff, Liz and myself to continue towards Grasmere along the picturesque valley. Jeff had read about the Coast to Coast on the internet and decided that he had to do it for himself so he had travelled from Bombay to do the walk. We were very chuffed when he asked if we were Kev and Liz, as he had already been reading our website and was wondering if he would bump into us! It was intriguing to think that someone from India had been reading all about our trips on the website. 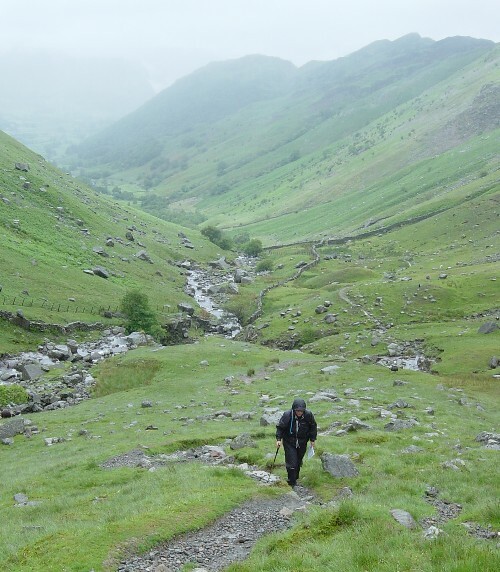 Jeff was staying in Grasmere and deep down we weren't that convinced it would be a good idea to go much further ourselves we had already crossed over one range of hills and would still have another to cross before we reached our destination. 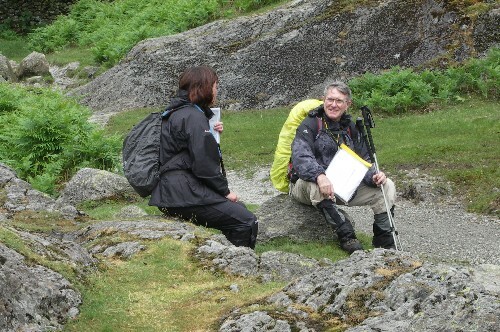 However we said our goodbyes to Jeff outside Grasmere and pushed on as the drizzle started to fall again. By now all thoughts of going over one of the higher routes had vanished, we just wanted to get to the end. The views towards Tongue Gill and Grisedale Tarn the direction where we had to go seemed very daunting, very high and covered in cloud. Would we make it? By now we were walking by ourselves but several groups passed by as we took our time walking along, including the wagon train, a group of 3 guys and one girl, who judging by their packs are camping. Travelling in single file and strict order they had passed us a number of times already today. One of the guys appears to be nominated as the map carrier and every now and then the other 3 have to peel off in strict single file formation and head back to him to check the map that was tied onto his back. As we were climbing up Little Tongue Gill we looked over and could see 2 people climbing the lower path on the other side of the valley. 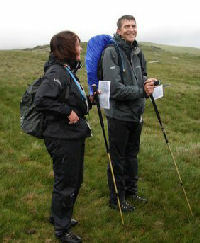 At first we thought it was Duncan and Naomi catching us up, but it turned out to be 2 guys, one was obviously a very experienced walker who was showing his friend the basics in how to navigate and map read. We nicknamed them the "gallant knights" as whenever we saw them they would ask how Lizzie was doing. Back to the walk and even though it was downhill from Grisedale Tarn to Patterdale, the path was quite rocky and tiring. We passed the 'Wagon Train' who had stopped to attend to the map carrier's blisters. The last part, according to the guidebook was through a pleasant area called Glenamara Park - great Liz thought, a park, it will be a nice easy path! Reality of course was a stony rocky path that proceeded to go up hill, before eventually winding down to Patterdale and ending in a hotel car park. So we were relieved to be arriving at our guest house 9 hours after setting off from Stonethwaite. Sadly because we had effectively jumped a stage we would lose contact with the people we had met over the last few days. Tired, exhausted but happy with what we had achieved after completing the toughest day so far. But also very glad that we had decided not to stop at Grasmere after all!